In their advancing years, writer-director-producers Joel and Ethan Coen have entered a melancholic, even elegiac phase of their filmmaking and, either consciously abandoning or simply outgrowing the condescension of so much earlier work, have made some of their best (if also darkest) pictures. True Grit, No Country for Old Men, and the somewhat overrated Inside Llewyn Davis all have been played straight with barely a satiric impulse, in contrast with earlier films where smug superiority was a modus operandi. 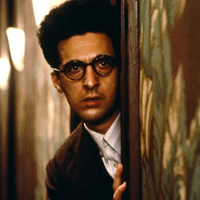 In the midst of ridiculing Midwestern yokels and Southern hayseeds, however, Joel and Ethan Coen pick on someone their own size in Barton Fink: the movie business and maybe even themselves, as represented by a pretentious lefty playwright of the 1930s who loves the People as a concept but despises the real thing. Recruited by Hollywood, the high-minded Fink is no match for Michael Learner’s megalomaniacal studio Medici or John Goodman’s “insurance salesman,” who’s all apologies and self-deprecation until his shotgun-toting rampage down hotel halls screaming “I’ll show you the life of the mind!” while the floor flames beneath his feet. Splendidly shot by Roger Deakins, Barton Fink is equal parts Marcel Duchamp, Buster Keaton, and Richard Wagner, not to mention Nathanael West; you can only yearn for what the Coens might have done with The Day of the Locust if this movie didn’t render the prospect redundant. Notwithstanding their latter day maturation, this remains the Coens’ masterpiece, taking a good chomp as it does out of the hand that has fed them.